I’m not generally fond of what are often called ‘Coffee Table Books’ – those large books of artfully lit photographs that serve to sit around on coffee tables for your guests to browse and think how clever and cultured you are. I have a friend who always has arty books and magazines daintily arranged about the house and whilst I’ll pick one up and flick through, it’s not often I’d go looking for such a thing. The one exception I’d make to that are the photographic publications of the National Geographic – big, lush volumes stuffed full of eye-wateringly gorgeous and mentally-stimulating photographs. 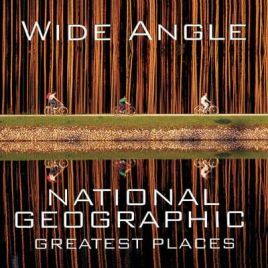 I was strolling past the Age Concern book shop in my local town and this book – Wide Angle National Geographic Greatest Places – lured me off my course and into the shop. Wide Angle is a whopper of a book, one so big that you really need the aforementioned coffee table to rest it on because it’s just so big and so heavy. In its 500 pages it offers a visual feast of the world’s most beautiful views, many of them presented as full double page spreads – the Wide Angle shots of the title. If you are like me and take your camera on your travels, this book will soon remind you that you really are no photographer because we’re all just ‘snappers’ when faced with such evidence of excellence. The book is split into twelve geographic chapters which form a world journey that starts in East and Southeast Asia, swings through Oceania and Central and South Asia, pops up in the Middle East before zapping over to three distinctly different parts of Europe. It then heads down through Africa, before crossing the Atlantic and taking a jaunt through the Americas before ending in the polar regions. The pictures are taken from the National Geographic archive of more than 10 million pictures. You can only wonder how they ever chose the ones they included. Many of the pictures have never appeared in print before which is a crying shame for both viewers and the photographers who took them. Each chapter is introduced with a few pages about the region that’s covered. The locations of all the photos are identified along with the names of the artists that took them and the date when they were taken – just the basic facts of the photo. We as viewers are left to wonder how the photos came to be and to make up our own stories to fit the frames. Perhaps if we spend enough time looking at and studying these pictures, even we amateurs can train our eyes to see the photographic opportunities in our travels. Views are popular but I particularly envy the shots of people, many of them caught unaware and just going about their daily life. Animals are also popular subjects, as you’d expect with National Geographic on the cover. Most of the pictures are in colour but tucked in between are occasional black and white shots dating back to the early 20th century and capturing lost lifestyles. Few of the pictures play up to the typical tourist clichés and even when the object of a photo is perhaps a little ‘obvious’ like the Taj Mahal or the Wailing Wall in Jerusalem, almost without exception the photographers have found a different angle – such as taking the Taj from the wrong side of the river and capturing only the reflection and not the building itself and focusing the image on a boy collecting water from the river. The photograph of Red Square looks down on Lenin’s Tomb with St Basils cathedral – the usual ‘money shot’ – stuffed off to one side like an afterthought, and your eyes drawn to some industrial-looking towers on top of a distant building. I paid £5 for this big fat book of photographic delights and it was worth every penny and many more. The cover price is $30 but you should be able to get it on Amazon marketplace for much less. To be fair, even at $30 it’s a small price to pay for such a giant book of inspiration and delight. No Comments on "Wide Angle National Geographic Greatest Places"